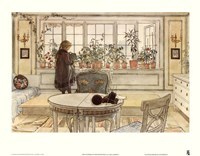 Carl Larsson (Born 28, May 1853) was born in Stockholm, Sweden. 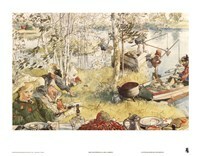 He was a painter, artist and illustrator who was a representative of the Arts and Crafts Movement in Sweden. 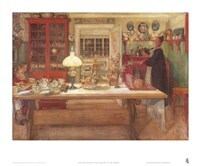 His many paintings include frescoes, watercolors, and oils. He considered his best piece of work to be Midwinter Sacrifice (Midvinterblot), which was a large wall mural. This piece is now on display in the Swedish National Museum of Fine Arts. His strong artistic talent was discovered early in his life. Larsson was born in an extremely poor family, and he never had a happy childhood. He even attended the school for poor children. 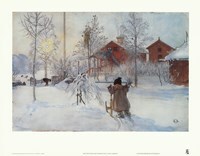 At the age of 13, in 1866, his teacher urged him to apply to the Royal Swedish Academy of Arts. He was lucky and he got admitted to the academy. During his first years in the academy, he felt shy, confused, and socially inferior. At the age of 16, in 1869, he got a promotion to the "antique school." There, he gained confidence, and, due to his hard work and the quality of his work, he even became a central figure in the academy. Larsson earned his 1st medal in drawing nudes. In the meantime, the artist worked for a humorous paper Kasper as a caricaturist and for Ny Illustrerad Tidning newspaper as graphic artist. His yearly earnings were enough to allow him to help his mother and father financially. 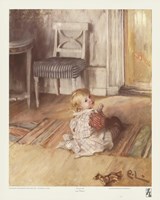 In 1877, Larsson moved to Paris after several years illustrating newspapers, magazines, and books. In Paris, he spent several exasperating years as a hardworking artist with no success.